Curiosity's "JPL" Could Become "SOS"
The Mars Science Laboratory (MSL) rover Curiosity rover stamps a distinctive pattern into its tracks as it drives across the surface of the Red Planet. Dots and dashes cut into the wheels spell out “JPL” in Morse code. Engineers at NASA’s Jet Propulsion Laboratory came up with the design as a way to put JPL’s mark on the rover and in turn on the surface of Mars. Lately however, unintended holes have opened up on the rover’s six wheels which are made of aviation-grade aluminum. While the software that controls NASA’s Curiosity rover can be patched, the robot’s increasingly damaged wheels cannot. What started out as a novel way to promote JPL – could evolve into a problem which might jeopardize the mission. On Friday, December 20, JPL issued a press release about recent upgrades that were made to Curiosity’s software and planned actions to investigate accelerating wear to the rover’s wheels. The team at JPL which controls the rover has successfully updated its software and is planning a check on the condition of its wheels. “Curiosity is now operating on version 11 of its flight software,” said Jim Erickson of NASA’s Jet Propulsion Laboratory, project manager for the NASA Mars Science Laboratory Project, which operates Curiosity. The new software took about a week to install. An earlier attempt on November 7 caused Curiosity to go into safe mode and forced a return to version10 but this time the transition went smoothly. The new software expands Curiosity’s ability to use its robotic arm while on slopes and improves flexibility for saving information overnight for resuming autonomous driving the next day. Zoomed-in images of wear on Curiosity’s left-front wheel. The top image is from Sol 177 and the bottom image is from Sol 488 (Credits: NASA/JPL). 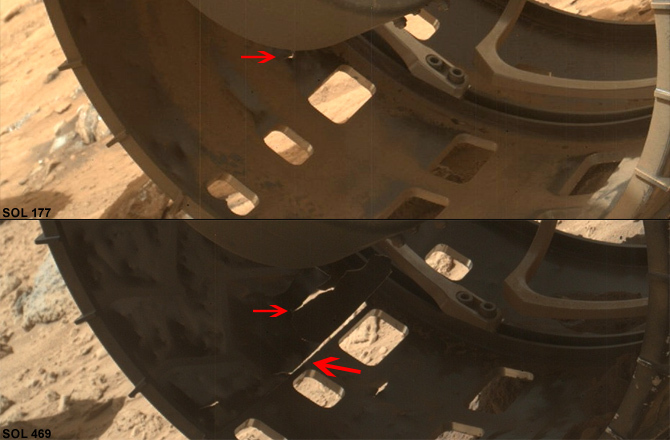 Concerns about wear and tear to Curiosity’s wheels are not new. Writing for Discovery News, Ian O’Neil noted dents and scratches on the rover’s wheels in May, 2013. At the time, this was considered normal wear and tear but in recent months the rate of wheel damage seems to have accelerated. In the near future the team plans to drive the rover to a comparatively smooth patch of ground to take a series of images of its wheels using the Mars Hand Lens Imager (MAHLI) camera. The MAHLI is located at the end of Curiosity’s robotic arm. Curiosity has recently driven through areas with numerous sharp rocks embedded in the ground. The rocks have caused holes in the six aluminum wheels and in some cases peeled back flaps of cut metal. One of the more worrying gashes is on the left-front wheel, near the dot-and dashes cutouts that spell out “JPL” in Morse code. What was only a small ding on Sol 177 had grown considerably by Sol 488. Curiosity has driven about three miles since landing in Gale Crater last August. The routes of future exploration may be determined in part by the assessment of the condition of Curiosity’s six wheels. Rover drivers may have to plot detours around rough terrain. This task will become even more challenging when the rover begins its ascent of Mount Sharp, the 5.5-kilometer mountain at the center of Gale Crater. This journey is crucial to Curiosity’s ultimate goal of uncovering information about the past habitability of Mars. Hopefully lessons learned from the Curiosity’s mission can be applied to improvements to NASA’s next Mars rover which is scheduled for 2020 and based largely on Curiosity’s design. Concept drawings for the 2020 rover show it with the same wheels as Curiosity, including the JPL dots and dashes cutouts. – By Jim Sharkey – This article was written using information from a NASA JPL press release, the 2020 Rover mission website and articles from Discovery News. Feature image: The left-front wheel of NASA’s Curiosity Mars rover shows dents and holes in this photo taken during the 469th Martian day, or sol, of the rover’s work on Mars (Nov. 30, 2013, Credits: NASA/JPL). The SpaceFlight Group and its news arm, SpaceFlight Insider, brings the thrill of spaceflight directly to you. Our skilled journalists, photographers, and media experts are dedicated to sharing their passion for space with the world. Visit us at www.spaceflightinsider.com. Curiosity Rover Snaps Self-Portrait, Finds Data "For the History Books"